I need help designing a tattoo, please. Firefighter1219 started a topic I need help designing a tattoo, please. For as long as I can remember, I have wanted to decorate myself with tattoos. 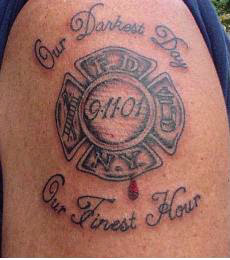 Ever since 9-11, I knew that I wanted my first tattoo to be a tribute to the fallen heroes of FDNY. I wasn't able to come up with a design until last night. I was watching the show American Choppers on the Discovery Channel last night when I knew what I wanted the tattoo to have in it. I saw the number 343 being painted on one of the fenders and I knew that it should be in the center of the design. I was thinking that the design will start with a maltese cross. In the top there will be the word "In". On the left there will be "Loving". On the right there will be "Memory". On the bottom there will be "FDNY". In the circle in the middle there will the numbering "343" with flames coming from it. Under the number will be 9-11-01. My artistic abilities are very limited, so I was hoping that some of you could give me some sugguestions as to what colors and styles of letters I should use. Please feel free to make any sugguestions that you think will help me in the designing of this tattoo. Also let me know if I should add to or change the words. I love tattoos planted one little in my back neck. My friends love it. It is very interesting gives me style and confidence. Nah, all these tattoos are pretty bad! I would recommend you to find a professional tattoo master, who is able to make you a tattoo you want to. Also, it is possible to use google and find similar tattoos which are similar to what are you looking for. For example, there is a website with a ready designs https://tattoozza.com/mens-tattoo Pick up your favorite and go to a tattoo master. Good luck! No artie...not my arm... Let me try again.... I was trying to post my tattoo on a thread way back when and it would work....(I am stupid that way sometimes) and respect said to send it and that when I get it returned I could post it...... Make sense now...??? I think I have a winner. I am going to use the basic design of the drawing that I did, but I'm not sure about the colors. I will incorporate the axes and the flames from the existing tattoo, the banner will be an American flag, and the grey towers I drew will look sort of like the towers on the other tattoo. I thought Respectfrmcalgary was going to return mine to me so I could post it on here. Was having trouble and sent it that way for duplication...but I never got it back. When you get a tattoo it is something you will have forever unless you have it removed...(a mess).. Therefore you have to design it yourself and do what you think will be something that you will wear forever. Using other sites for ideas is great. But no one else can tell you what to wear. I suggest you do this also. Ask the artist for his honest opinion of what you draw and ask him to "fix it" for you. I had mine done in a place in Clearwater Florida and recommend the guy to anyone who wants to get one that is in that area. Thanks for posting that link, brother. I am going to use one of the designs from that site, but I will use my own wording. All times are GMT-5. This page was generated at 12:24 PM.